BOSTON (AP) — If his 19th NFL season has been at all more taxing than any of the previous 18, Tom Brady isn’t willing to say so. Even if his play on the field through the Patriots‘ first 10 games this season might suggest otherwise. Last season, at age 40 Brady became the oldest player in NFL history to earn regular-season MVP honors. A year later, he finds himself in the throes of some his worst passing numbers in three seasons as the Patriots head into their bye week. What’s unclear is whether it’s an aberration or perhaps the first subtle signs of decline for the 41-year-old quarterback. It’s not as if Brady is having a disastrous year. Despite coming off a humbling 34-10 loss to Tennessee , New England still enters its bye with a 7-3 record and is on its way to capturing its 10th straight AFC East title. Brady is still completing 65 percent of his passes and has 17 touchdowns. He’s done it despite having to break in new players in the receiving group, dealing with injuries at running back and seeing tight end Rob Gronkowski battle ankle and back injuries. 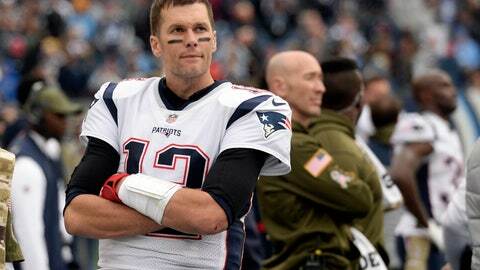 In recent years Brady has typically shrugged off questions about his health or any injuries he might be dealing with. It included him famously wearing a glove during the playoffs last season to shield the extent of a cut he sustained on his throwing hand prior to the AFC championship game. That same, guarded posture has extended to all inquiries about whether any of the hits he’s taken this season have affected his performance. “Some bumps and bruises, but I think that’s part of football season and I feel pretty good,” he added. There’s definitely been more hiccups that usual in the passing game for the Patriots. In his first seven games this season, Brady had a passer rating of 100 or greater five times, while completing 67 percent of his passes and throwing for 16 touchdowns. He did it despite being sacked nine times during those games and tossing seven interceptions. He hasn’t thrown any picks over the Patriots’ past three games, but he’s been sacked seven additional times. He’s also thrown just one TD pass and seen his completion rate drop to 59 percent with a passer rating of 85.1. Brady is also being asked to do more outside of the pocket, serving as a blocker on trick plays and even catching a pass during the loss to the Titans. And because of New England’s injury issues at running back, Brady’s number has been called more often for quarterback sneaks. “I think we’re certainly aware of that, but there’s certain things that I think you have to do sometimes to win the game,” Patriots coach Bill Belichick said. Belichick said he doesn’t believe they are putting more of a load on Brady than they think he can handle. Running back James White said the onus on protecting Brady extends across the entire offense. That includes better blitz pickup by everyone. “Definitely need to be better just communicating and when we do — when we are on the same page — do a better job of getting Tom enough time to read the coverage out and if he decides to hold the ball, still give him enough time to do that, too,” White said. Brady said he’ll be using the time off to recharge going into the stretch run of the regular season. He said improvement must come across the board.